This is an amber coloured, high viscosity liquid based on aminoacids. It is a lipophilic ingredient, ECOCERT and COSMOS approved and effective even at very low dosages. PCA is capable of attaching to hair and replacing the lipid layer that has been washed off by chemical treatments and harsh cleansing products. It doesn't build up and has a very light feel. Although it is not a stand-alone hair conditioner, it improves wet combability and reduces static electricity. 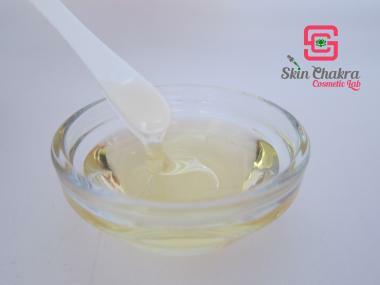 PCA Glyceryl Oleate is compatible with all kinds of surfactants (it becomes cationic at a pH lower than 5,5 but does not sediment with anionic surfactants). In skin care, it is used as a refatting ingredient and is praised for its non-greasy film-forming properties. PCA Glyceryl Oleate could be cold or hot processed. In surfactant containing products (shampoo, shower gel) blend it with the surfactant phase. In Emulsions, add it to the oil phase. For waterless conditioning balms and putties, add it to the hot oil phase. For application in water based products (anti-frizz or hair tonic for instance) blend it in the solubilizer phase.